The surgery is performed under spinal or general anesthesia. During the procedure, a surgical cut is made over the hip to expose the hip joint and the femur is dislocated from the acetabulum. The surface of the socket is cleaned, and the damaged or arthritic bone is removed using a reamer. The acetabular component is inserted into the socket using screws or occasionally bone cement. 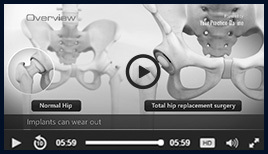 A liner made of plastic, ceramic or metal is placed inside the acetabular component. The femur or thigh bone is then prepared by removing the arthritic bone using special instruments, to exactly fit the new metal femoral component. The femoral component is then inserted to the femur either by a press fit or using bone cement. Then the femoral head component made of metal or ceramic is placed on the femoral stem.